These photographs show two views of Main Street in Erie, Kansas. The first photograph shows the east side of the street, looking south. In the foreground is the first courthouse, built in 1867 by Truman T. Gilbert. 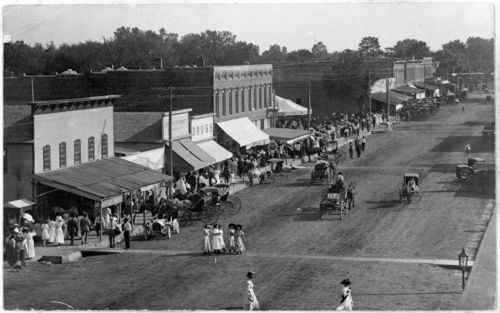 In the middle are the drug store run by Dr. M. E. Lake and the brick post office built between 1902 and 1906 by Richard M. Thomas, a railroad conductor. Crowds of people are visible on the sidewalk, and a circus tent has been set up. The second photograph also shows the drugstore and post office on the east side of Main Street, but looking north. There are no buildings south of the brick post office, which advertises Owl Cigars, because they were destroyed by fire in 1906. Holding Institution: Mrs. James Postma, 1976.